Mats Anderson, in Sweden tattooed the Crazy Aaron cartoon logo on his leg out of sheer putty love. It was a trying ordeal for Mats. After the tattoo was applied, he developed sepsis, was hospitalized, and endured a great deal of pain. Thankfully, everything worked out perfectly! You can read the whole story or just Mats' last letter to me. Either way, it should give you a good chuckle. Want to show your undying devotion to Crazy Aaron's Thinking Putty? Whatever you do, I'm sure I can find a way to say thank you! I received an email today from customer Nikki Atkins who works for NOAA (the National Oceanic and Atmospheric Administration). "I just received my putty order in the mail today, and wanted to say thanks! The colors (blue and black) are beautiful and will work wonderfully for their intended purpose. i work in a lab where we age fish. 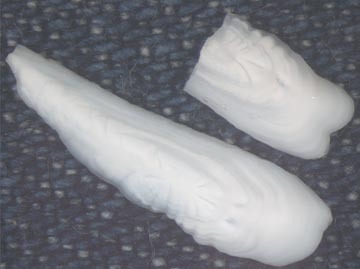 The otoliths (also called ear bones) are small bones in the inner ear of the fish, and we break them in half and look at the cross-section. Like trees, otoliths gain a new growth ring each year, so we can count these rings to determine the fish's age. The putty comes in as a way to stand the otoliths on end while we look at the cross section under a microscope. Often we use clay but the mineral oil used to clarify the cross section makes clay dissolve over time. Regular old putty is too light-colored, and hurts the eyes when you have to stare at it under strong light all day. i was trilled to find your site - the dark putty colors are perfect, and your putty is stiffer than the average stuff which means the otoliths don't slump and tip over as fast. It also means that the "well" i make in my putty to hold water for looking at otolith surfaces doesn't close up as fast. Very cool stuff. 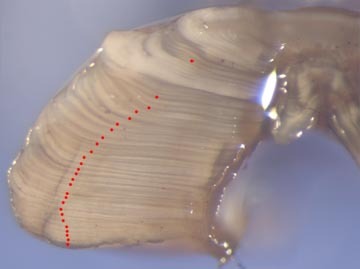 I didn't know that fish ear bones grew like tree rings. This isn't the first time I've heard of a customer using Thinking Putty to hold things in place. A number of large online stores use it to hold items in place during product photography. We've custom made putty that can hold its shape under the hot photographic lights. We've also custom colored it for customers to match a particular background and help the 'holder' become invisible.